A glass of wine on a Saturday evening and Young Montalbano or a slice of Scandi-noir on the box? Absolutely! Chocolate? Of course, as long as it is dark and expensive. A meal out (or cooked by someone else) is always welcome. Flowers? I love flowers and often buy them for myself. And yet when all is said and done, there isn’t much to beat buying a brand-new paperback that you’ve been longing for – and that was what I did in the Sheffield branch of Waterstone’s last Saturday. 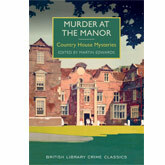 Murder at the Manor: Country House Mysteries, edited by my friend, Martin Edwards, is the latest in the spectacularly successful series of British Library Crime Classics. Yet even as she shot home the last bolt of the front door, at the back of Nurse Cherry’s mind was a vague misgiving. Blimey! They certainly knew how to cut to the chase in those days. I’m rationing myself so that I don’t gulp the stories down all at once. I’m glad I won’t be on my own this evening when I plan to read this one. I have this on the tbr shelves & I’m looking forward to it. One story a day sounds like a very good idea. Mmm . . . not sure about keeping to just one! But I’m trying not to read more two at a time. I totally understand and agree, though my treat would be a full-length crime book. And if it’s a really great one, this happens: As I approach the last chapters, the final sixth, say, I put it down. Then, I go and make coffee or tea, collect a biscuit, draw the curtains, arrange seat, cushions, throw for maximum comfort – and only then sit down to enjoy the ending. But that’s only worth doing for the best books…. So much enjoyed this glimpse in the reading life chez Moira. It is best if there is no-one else in the house to interrupt at a crucial moment, isn’t it? and it’s especially enjoyable, I find, if you really ought to be doing something else. Do you also save up books that you know you are going to love, so that you can enjoy the cosy feeling of knowing that you have them in store?